In our Monday post one bullet point noted the favorable equity market returns achieved in a pre-election year. Today, Chart of the Day sent out a chart which graphically shows favorable returns that historically have been generated during the first seven months of pre-election years. 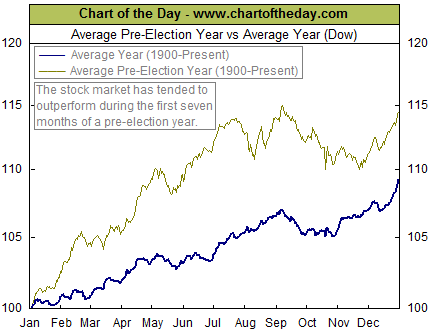 "Since 1900, the stock market has tended to outperform during the first seven months of the average pre-election year. For the remainder of the year, pre-election performance has tended to be choppy and slightly subpar. In the end, however, the stock market has tended to outperform during the entirety of the pre-election year. One theory to support this behavior is that the party in power will make difficult economic decisions in the early years of a presidential cycle and then do everything within its power to stimulate the economy during the latter years in order to increase the odds of re-election." As the the calendar begins a new trading year on Friday, commentary will likely shift to other seasonal market indicators. One such indicator notes that so goes the first five trading days in January so goes the rest of the year. Unless the market experiences a major catastrophe today, this indicator gave investors a false signal in 2014. According to the Stock Trader's Almanac, the first five trading days of 2014 had the S&P 500 Index down .6% while the S&P is up mid teens percent as I write. In spite of this fact, the Almanac notes, "the last 41 up Five Days were followed by full-year gains 35 times for an 85% accuracy ratio and a 14.0% average gain in all 41 years." The past two years have been rewarding ones for investors. Seasonality alone will not trump fundamentals and the turmoil in the energy market may be signaling broader issues with the underlying economy. We plan on touching on this issue in our upcoming quarterly Investor Letter and additional posts in January. The day after Christmas saw the S&P 500 Index hit its 52nd record close for the year. Of note this past week was the strong GDP report (third estimate) for the third quarter reported at 5%. This was higher than the 4.3% consensus estimate. A potential offset to the strength in the GDP report was the durable goods report for November. The consensus estimate was a 3.1% increase with the actual report showing a decline of .7% . Oil prices continue to be a focus and Aswath Damodaran, Professor of Finance at the Stern School of Business at NYU, wrote an good article about the potential impact to various sectors of the market as a result of the decline in oil prices. A number of the articles in this week's magazine continues to highlight the issues surrounding hte energy sector. As a final note, the Stock Trader's Almanac Blog noted the following about the current market cycle. 2015 is a pre-presidential election year, the best year of the 4-year cycle. Since their last loss in 1939, the third year of the cycle is up 16.0% on average for the Dow and 16.3% for the S&P 500. Since 1971 NASDAQ averages a whopping 30.9% in the third year of the 4-year cycle. It is also the fifth year of the decade, which is also the best year of the decade with only one loss in the past thirteen decades. Years ending in “5” average 28.3% for the Dow and its predecessors since 1885, with S&P 500 averaging 25.3% since 1935 and NASDAQ averaging 25.6% since 1975. We are also now firmly in the sweet spot of the 4-year cycle (midterm Q4 & pre-election Q1-2). These best three quarters of the 4-year cycle have produce averaged gains of 21.5% for the Dow and 22.2% for the S&P 500 since 1950 and 34.1% for NASDAQ since 1974. With the market entering what has historically been a strong cycle period, the next magazine will likely focus on forecast for 2015 for what they are worth. Below is the link to this week's magazine. 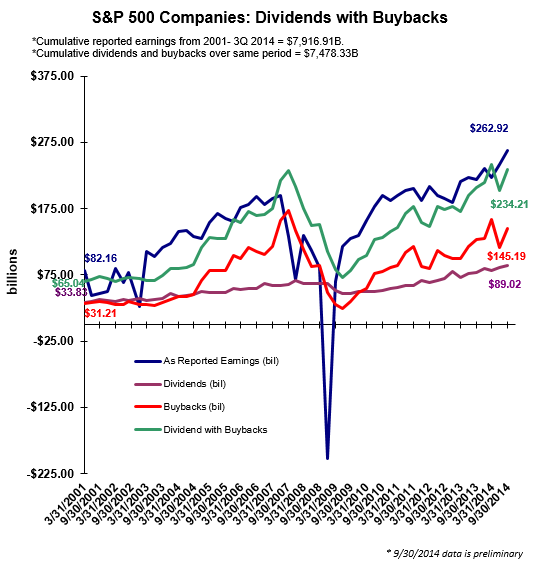 After the second quarter's significant decline in buyback activity, S&P Dow Jones Indices preliminarily reports S&P 500 companies increased third quarter buybacks by 25%. 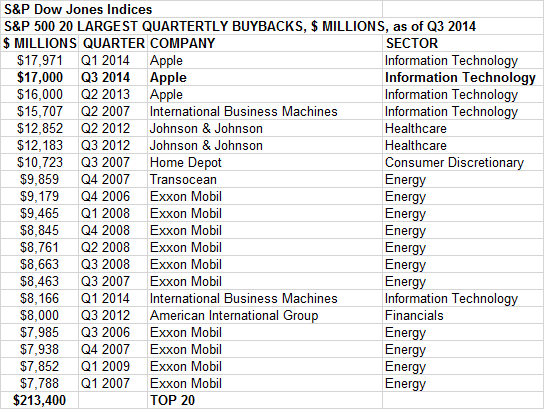 Buybacks for the third quarter totaled $145.2 billion versus the $116.2 billion reported in the second quarter. Apple (AAPL) holds the top three spots in record quarterly buybacks with the third quarter amounting to $17 billion. This is just short of the record level of $17.97 billion in the first quarter of this year held by Apple. "While third quarter expenditures were up 25%, the number of companies reducing their share count declined 13%. Still, over half of the S&P 500 issues reduced their share count with 20% decreasing them enough to impact their year-over-year EPS by at least 4%." 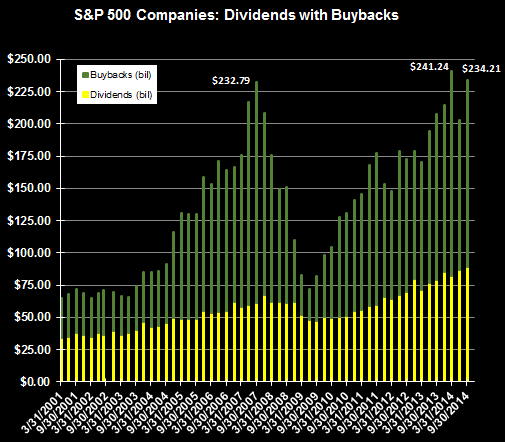 "...companies continue to increase their total shareholders’ returns through regular cash dividends, as well as buybacks. Over the year ended September 2014, buyback and dividend expenditures combined reached a new record high of $892.7 billion, with buybacks representing 62.0% of the total." Silverblatt believes the forth quarter will also be a strong period for buyback activity. In spite of the fact the market seems to experience a much awaited 10% correction, the last few weeks of a calendar year are generally positive ones for equity returns. Below is a chart of various indices prepared by Charles Schwab outlining the returns over the last two weeks of the year looking back twenty years. The FTSE 100 Index historically generates the highest return for investors; however, other noted markets have been positive as well. At this point in time we remain positive on the longer term direction of the equity market. By that, we are not expecting this bull market to revert to a full blown bear market. Market pullbacks seem few and far between of late, but are healthy and necessary in order to sustain a longer term trend like the one investors are enjoying since the end financial crises in 2009. The catalyst for the current market pullback certainly is different. The oversupply in oil and the resultant rapid contraction in oil prices was not a factor on investors minds just a few short months ago. Contributing to the oversupply in oil is the fact oil demand also seems to be on the decline. The question for investors and the market is whether the supply/demand issue is the result of a broader economic slowdown globally. This unanswered question is contributing to the equity market's recent decline. Oil dominated economies like Russia's have been negatively impacted by this price decline. In order to address the negative impact of the oil price decline and the weakness in the Ruble, yesterday, Russia's central bank increased its key interest rate to 17% from 10.5%. Also, a melt up in long term treasury bond prices is an outcome nearly no one predicted at the beginning of 2014. Even if treasury bond prices turn lower (rates rise) the article referenced in the just noted link indicates bond prices do not experience crashes like stocks do in their downturn. At HORAN we constant evaluate fundamental data related to company earnings and the economy. Also, we believe reviewing technical data specific to stocks and the economy is a valuable input in investment decisions. Investors should note it is impossible to predict market bottoms to the day. From a technical perspective then, as we look at just the S&P 500 Index, we do believe the market is nearing a bottom, but maybe not quite there as can be seen in the below chart. No single technical indicator is a panacea to the timing of a particular stock purchase or sale. With this said, one indicator investors might find useful the TRIX momentum indicator. This indicator is a momentum oscillator that displays the percent rate of change of a triple exponentially smoothed moving average. The TRIX is designed to filter out insignificant price movements. As shown in the below chart the TRIX experienced a crossover in early December and has yet to reach a low or at least cross below the zero center line. On a weekly basis, the TRIX attempted a cross above the signal line which appears to have failed as can be seen in the chart at this link. Lastly, the below chart also shows the S&P 500 Index closed just below its 150 day moving average. The market will need to reclaim the 150 day M.A. 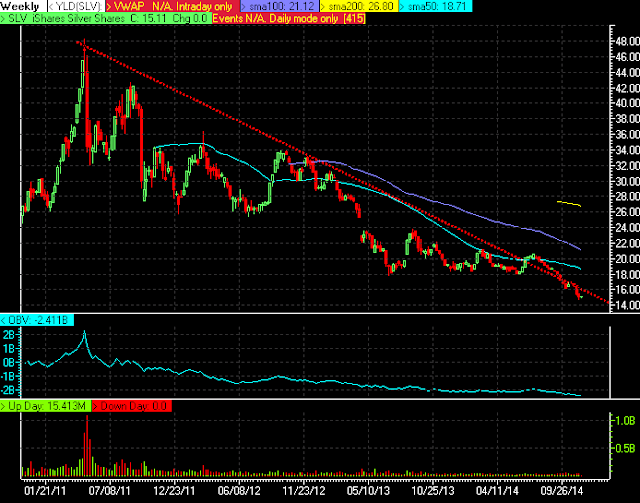 or else the 200 day MA at 1,947 will come into play as the next support level. Wednesday is a Fed announcement day which will cause potentially more market volatility. Friday is a quadruple witching day and this often results in higher trading volume as well as increased market volatility. As stated earlier, no one technical indicator will indicate a turning point in the market; however, these type of indicators provide some insight into the sentiment around the market and/or particular investments. While probabilities are good for a post-Fed, Santa bounce back, the price action has not confirmed that bullish scenario. In addition, we still don't have any bullish reversal setups to work with as the series of lower lows, low highs continues to unfold. Tomorrow is Fed day and expectations are high that Fed and Janet Yellen will do or say something to save Christmas from the Grinch this year. From a price action perspective, we don’t have any indication of that yet but we will continue to keep our eyes open and trade what we see, not what we expect or want to see instead. I suspect oil price movements will continue to garner many of the headlines during the coming week. During the past week, most of the economic reports were either positive or neutral. retail sales came in better than expected along with a spike higher in consumer sentiment. the release of the Fed's Labor Market Conditions Index for November was the lowest since January 2014 which suggests a softening labor market. the Job Openings and Labor Turnover report was essentially unchanged for October (December report). inflation continues to remain in check at the producer level as the producer price index ex food and energy was flat for November. When food and energy is included, the headline PPI declined .2%. 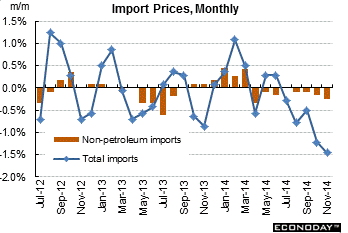 import prices continue to decline by dropping 1.5% in November. This decline in import prices has been a trend in place since the beginning of the year. A number of articles in this week's magazine look at the factors behind the fall in oil prices. As we have noted in several posts over the course of the past few weeks, we believe supply is only one factor driving prices lower. An article or two in the magazine note the impact that lower demand is having on oil prices as well. Broadly, this lower demand has implications for the strength of the global economy. For sure economic activity outside the U.S. has been slowing in many countries. For the moment the U.S. economy seems to have disconnected from the slowdown impacting the euro-zone and China, to name a few regions. A question then arise about the reality on what has once been a global synchronized growth story, if a globally connected world can truly operate on opposing economic cycles. Broadly, this is what the market may be trying to figure out, especially if one believes oil demand, or lack thereof, is also a cause for the drop in a price of oil. Below is the link to this week's magazine. Energy's Ripple Effect Or Is It A Tidal Wave? Crude oil prices continue to take a beating and are seemly dragging the entire market lower this past week. A market concern now is the fact the price of a barrel of WTI crude has broken longer term support that had been in place for twenty years as can be seen in the chart below. Market participants have a new worry if crude does not rebound to reclaim this long term support level--the free fall will continue. The next support level is just above $50 per barrel and if that does not hold, the mid $30 per barrel price could come in to play. More importantly, fundamentally, what is behind this price decline? The fact OPEC could not come to an agreement on production reductions has put the blame for the decline on oversupply. Supply is a significant contributor to the decline. We also believe demand for oil is playing a role as well as we noted in a post earlier this week. Earlier this month OPEC reduced its 2015 demand forecast and Friday the International Energy Agency reduced oil demand for 2015. The issue that rises to the top then is whether or not this potential demand reduction is a sign of a global economy that is entering a period of significantly slower growth, i.e., entering a global recession. At this point in time we believe this does not occur and the U.S. weathers the slow down that is occurring outside its borders. 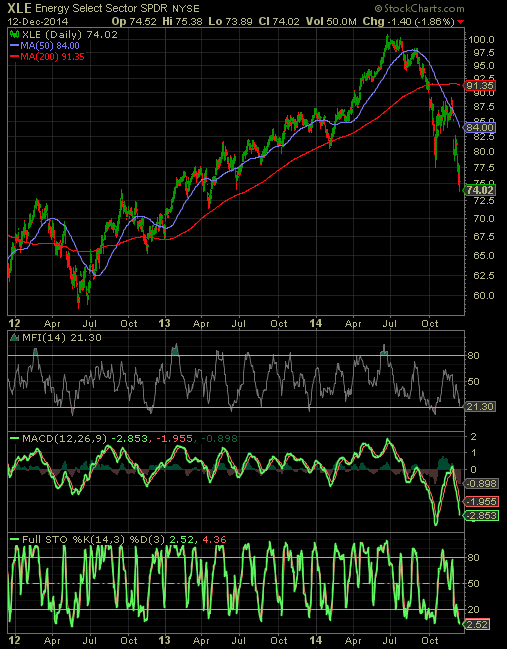 From a pure technical perspective we believe oil and energy related stocks are trading at extreme oversold levels. The first chart below is WTI crude and the technical indicators below the chart are indicating extreme oversold levels and possibly a bounce can occur in the coming trading days. Additionally, the S&P energy sector as represented by the SPDR Energy Sector ETF (XLE) is similarly trading at oversold levels. As they say, "the trend is your friend" and in the case of oil and energy, the trend is in the wrong direction. Investors stepping up to buy into this sell off in those stocks negatively impacted by the energy slide feel as though they may be catching a falling knife. However, for long term investors, a number of stocks are beginning to offer entry points that could be rewarding longer term. Is The Recent Market Decline Really A Rout? On a price only basis the S&P 500 Index is down 3.86% from the high reached on December 5, 2014 and headlines describe this recent market action as a "rout" or a market "tumble." I do not intend to pick on the publishes of the below headlines as many articles have highlighted the recent market action in this way. These dramatic headlines can cause investors to loss sight of the real market action, and more importantly, the potential direction of the market as one looks ahead. 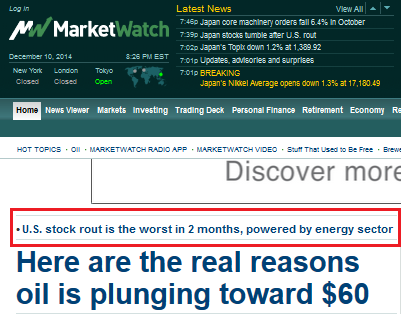 I would not argue with the fact that one market sector has "tumbled," the energy sector. 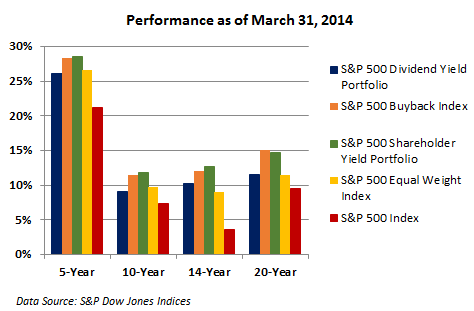 Other than the energy and telecom sector, investors have enjoyed respectable returns to date in 2014. Also, the S&P 500 Index remains up 11.8% in 2014 through today's close. This double digit return is on top of the 32+% return for the S&P 500 Index in 2013. 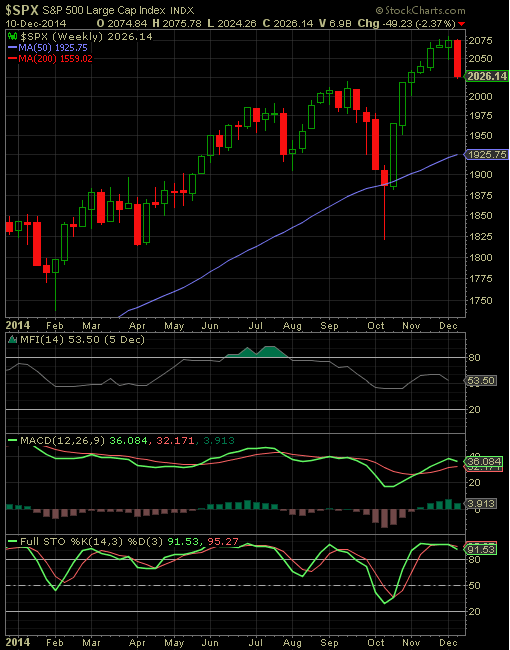 Below is a weekly chart of the S&P 500 Index. As evidenced by the chart, until this week, the S&P 500 Index has closed up for seven consecutive weeks. One fact that is a given is the market will not move higher every week of the year. As 2014 is rapidly nearing a close, investors should be evaluating the catalyst for this recent pullback as we are at HORAN. 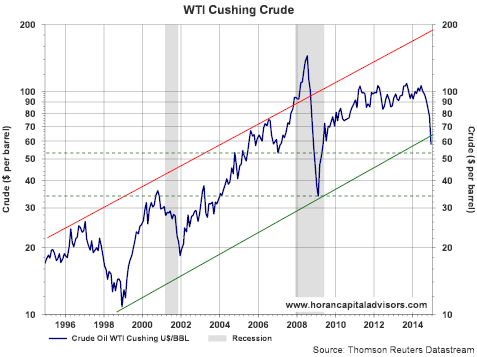 The main factor that seems to have caused the recent decline is the decline in oil prices. An obvious question investors may have is what industries and market segments benefit from the decline in oil prices. Sector beneficiaries that rise to the top are some types of retail as consumers have more cash to spend, trucking, rail and airlines. As we have pointed out to clients we have met with recently, we think the oversupply of oil is only one factor. We also believe the demand side of oil is contributing to the decline in oil prices. 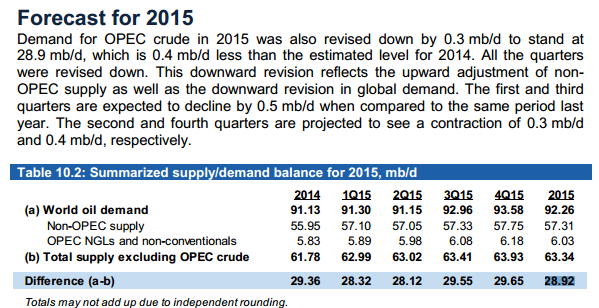 In a recently released 100 page report by OPEC, it is noted that OPEC is also projecting a decline in oil demand in 2015 as can be seen in the below table taken from the report. The slowdown in the emerging markets, especially in China, and the weaker economies in the eurozone and Japan all contribute to the reduction in the demand for oil. For now the U.S. economy seems to have disconnected from economies outside its borders and continues its "bump along" growth pace. Is this sustainable in the face of a broader economic slowdown? At the beginning of 2014 most strategist believed long bonds would not be a good investment as interest rates were expected to rise. Rates have actually declined and the iShare 20+ Year Treasury Bond ETF (TLT) is up over 20%. Many strategist believed Europe was turning the corner and this would be reflected in positive relative equity prices in 2014. The opposite has actually occurred. Now some believe most of the bad news is priced into eurozone equties (Time to overweight eurozone stocks? by Jim Paulsen, Ph.D of Wells Capital Management) so is it time to allocate investments there? In short, the recent equity market pullback is not a significant one. Could the decline materialize into a larger one? Most certainly. At the moment we do believe the U.S. economy will be a net beneficiary of lower oil prices. Some sectors that should benefit from lower oil prices, like the rails, have pulled back subsequent to the spike they enjoyed when the oil price decline began to accelerate as can be seen in the chart below. The advice for investors is if they are trying to buy the dips, understand why a stock or sector has declined. Other market segments such as energy MLPs have pulled back as well. Some believe this is a direct result of the decline in oil. Some MLPs, for example pipelines, are not directly impacted by oil price movements since pipeline MLPs generally get paid based on the volume of oil that runs through the pipeline. However, if demand is lower, volume could be less for sure. thus negatively impacting earnings. We also believe there is a political factor impacting MLP prices. Incoming House Ways and Means Committee Chairman Paul Ryan desires to overhaul business taxes in 2015. As reported by the Wall Street Journal, Ryan has indicated he wants to see changes to those companies and partnerships that are structured in a way they pay individual income taxes instead of corporate taxes. To us this sounds like a potentially negative tax impact for MLPs, REITs and S-Corporations. The point for investors is MLPs may be down in price for more reasons than simply oil related ones so do not buy the dips blindly. In conclusion, this current pullback may not be at an end; however, looking out to 2015, we do believe equities will provide investors with positive returns. A recent report from Charles Schwab, Why Global Economic Policy Is Likely to Boost Growth in 2015, provides a positive perspective on the fiscal and monetary policies around the globe and how the 2015 policy can benefit specific global regions. Improved global growth would certainly be a positive for equity prices. Washington, D.C. will likely do its part in grabbing headlines this week due to a potential government shutdown starting December 12th. Congress has until December 11th to approve a government funding bill before recessing on the 12th. Investors should keep in mind any market gyrations around these shutdown periods is more emotional than fundamental as we noted in a post in October of 2013, Government Shutdown: Time To Buy Or Sell Stocks? With this thought out of the way, as we look to the week ahead, a number of article links in this week's magazine highlight the seasonally strong period for the market at this time of year. Some of the articles look at this part of the calendar as the so-called "Santa Claus Rally", while other articles incorporate the strong 6th year of the Presidential Cycle. In any event, from a technical perspective this part of the calendar tends to favorable for equities. The decline in oil prices continues to dominate a few article links as well. The decline in oil prices is anticipated to put pressure on some of the marginal energy producers; thus, making them ripe for a takeover by the larger and better capital oil firms. Lastly, the economic report calendar is fairly full with the following reports likely to have the most impact on the market. The most important report this week will be the retail sales report on Thursday. Following is the link to this week's magazine. Effective on December 4th Bemis (BMS) was moved to the S&P Midcap 400 Index from the S&P 500 Index. BMS was replaced by Royal Caribbean Cruises (RCL). RCL was formally a member of the S&P 400 Midcap Index. On an ongoing basis S&P Dow Jones Indices evaluates the companies that comprise their various indices. A number of factors are required for a particular company to be included in an index and for that matter to be removed. Importantly, S&P notes, "...an index constituent that appears to violate criteria for addition to that index is not deleted unless ongoing conditions warrant an index change." Keeping in mind the factors used by S&P as detailed in the above link, Bemis had a market capitalization of approximately $4.1 billion and Royal Caribbean's market cap was $17.4 billion at the time of their index changes. From an unadjusted market capitalization perspective, S&P currently uses the following guidelines for each respective index. S&P 500 Index: $5.3 billion or more. S&P Midcap 400 Index $1.4 billion to $5.9 billion. 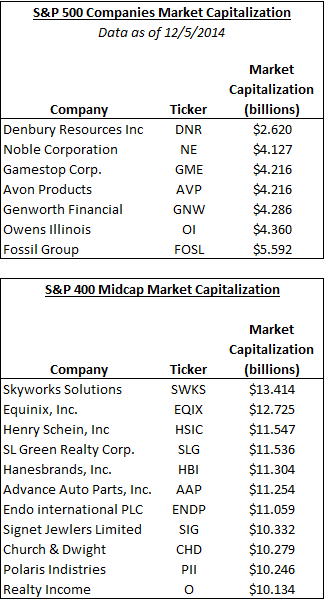 Below is a list of those companies in the S&P 500 Index that have the smallest market caps and those companies in the S&P Midcap 400 Index that have the largest market caps. Not surprisingly I suppose, conclusions are mixed as to whether it is a positive or negative to be added or deleted from the Index (here, here and here). Many reasons can result in a company being added/removed from the index. For example, removal can occur because a company's business prospects are declining and in that case future stock performance may be weak. On the other hand, a company may have sold portions of their business resulting in a smaller capitalized company that may actually perform well going into the future. One of the white papers at a link noted earlier in this paragraph concludes stocks added to the S&P 500 Index underperform due to the application of a larger discount rate because of potentially higher stock price volatility. For investors, understanding why a firm is added or deleted from an index is important. Evaluating a company's long term business prospect is more important than whether or not it is in a particular index. One aspect of the investing climate in 2014, due to the Fed's low interest rate policy, has been investor interest in dividend yielding equities. Finding dividend payers from companies that comprise the S&P 500 Index has become less difficult over time as more companies within the index pay a dividend. As the below table shows, 423 issues in the index now pay a dividend. From a performance perspective, we have highlighted the returns of the payers versus the non-payers from time to time. In looking at the returns below, on an average return basis the non-payers of the index have outperformed the payers through the first eleven months of this year, 15.58% versus 14.57%, respectively. Comparatively though, both the payers' and non-payers' average return has outpaced the cap weighted return of the S&P 500 Index itself. A part of the reason behind this has been the underperformance of a number of the mega cap stocks. The second chart below compares the price return of the Guggenheim Russell Top 50 Mega Cap ETF (XLG) to the S&P 500 Index. 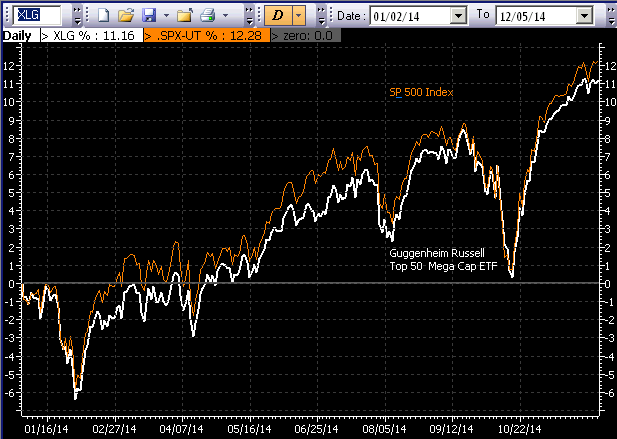 The mega cap stocks have underperformed the S&P 500 Index by almost 100 basis points or one full percentage point. The fact the Fed has stated it has ended the quantitative easing programs is no longer new news. Given this fact, it is anticipated the Fed will begin raising interest rates sometime in 2015. In a rising rate environment stocks can continue to perform well; however, the initial rate move can result in equities briefly turning lower. Some yield sensitive assets dropped lower this morning after the release of the job report, specifically REITs and utilities. Consequently, investors will need to be aware of the sensitivity of yield equities (and bonds for the matter) when rates are initially increased. One strategy pursued by some investors is the Dogs of the Dow Theory. In short, the theory suggests investors select the ten stocks that have the highest dividend yield from the stocks in the Dow Jones Industrial Index (DJIA) after the close of business on the last trading day of the year. Once the ten stocks are determined, an investor would invest an equal dollar amount in each of the ten stocks and hold them for the entire year. This strategy has generated mixed results over the years. As the month of November has come to an end, evaluating potential changes in the ten stocks to include in the strategy for 2015 yields several potential changes ahead. With the recent collapse of oil prices it is not a surprise to see the energy stocks in the Dow Jones Industrial Average rise to the top of potential 2015 Dow Dog candidates. 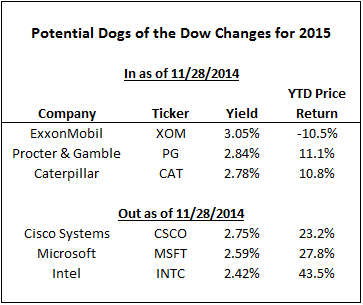 Chevron (CVX) is already a 2014 Dow Dog and it appears ExxonMobil (XOM) may join Chevron in 2015. Additionally, as the so-called "old technology" companies gained investor interest this year, the Dow Dog technology stocks appear to be on the way out in 2015. If Cisco (CSCO), Microsoft (MSFT) and Intel (INTC) are not Dow Dog members in 2015, the Dow Dog strategy will contain no technology stocks in the coming year. The potential inclusion of ExxonMobil is not a surprise given the weak performance of many of the energy related stocks. As the below chart notes, the energy sector has been the worst performing S&P 500 sector this year through the end of November. The November energy sector decline of 8.49% has taken the year to date sector return into negative territory with a YTD return of -8.24%. One of the top performing sectors this year has been technology so it is not a surprise that CSCO, MSFT and INTC participated in the strong technology performance. 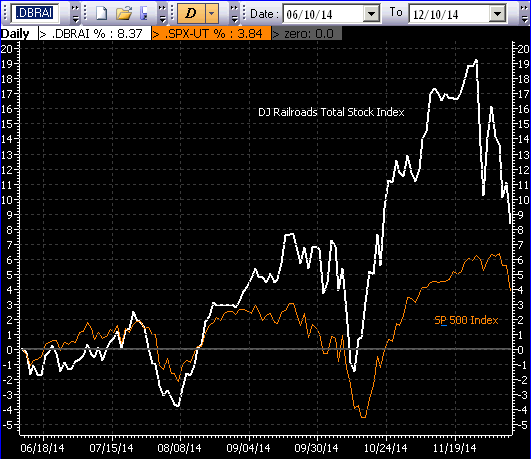 The Dow Dogs and to a greater extent the Dow index have underperformed the broader S&P 500 Index through November. 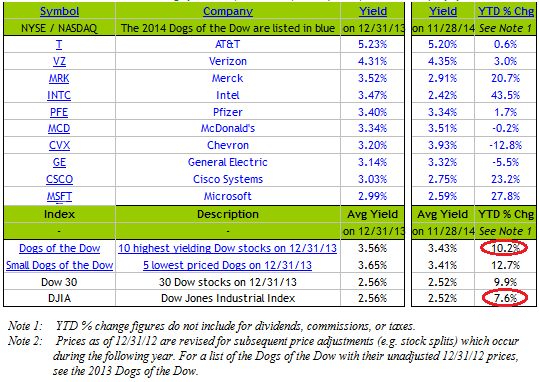 On a price only basis, the S&P is up 11.9%, the Dow Jones Industrial Average is up 7.6% and the Dogs are up 10.2%. Much can happen in December that could result in a different set of changes. Investors may be looking for the often stated Santa Claus rally, which tends to make the month of December a positive one for investors as recently highlighted by S&P Dow Jones Indices. The day after Thanksgiving was not like a Black Friday expected for retailers. Crude oil prices and many energy related stocks saw red as OPEC's Thursday meeting concluded with no reduction in production targets; hence, the oil glut will continue. The WTI crude price fell over 10% (-$7.54/bbl) to $66.15. For the year, WTI has lost 33 percent and the price of Brent has declined 37 percent. For investors interested in relevant articles surrounding the energy markets, below is a link to one of our Flipboard magazines highlighting a number of today's energy articles. We have noted in a number of posts over the years how dividend growth stocks tend to outperform the overall market (S&P 500 Index) over time. One reason this has occurred is the characteristic that dividend paying/growth stocks tend to comprise more of the defensive sectors of the S&P 500 Index. As a result in down markets, the dividend growth stocks tend to hold up much better than the broader market and the laws of compounding kick in and favor the growers. Recently though, S&P Dow Jones Indices looked at dividend growers, companies that buyback their shares and on a combined basis, top shareholder yield firms. S&P's comprehensive white paper on the topic, Examining Share Repurchasing and the S&P Buyback Indices, contains a wealth of information, but concludes the "shareholder yield" portfolios tend to outperform the other indices over time. As the below chart notes, the shareholder yield portfolio (green bar) has outperformed the other indices in all time periods except the 20-year return time frame. The white paper does note though, on a risk adjusted basis, the shareholder yield portfolio has the highest risk adjusted return for all time periods. The white paper analyzes the implications of dividend contribution to return and the impact of equal weighting. Also, the report looks at some of these strategies across different asset class, such as midcap and small cap. 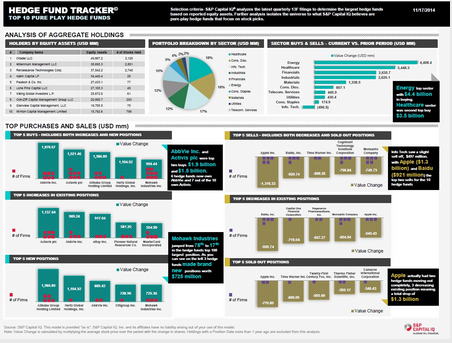 One interesting asset class is the S&P Global 1200 Buyback Portfolio (IPKW). Given the underperformance of stocks outside the U.S., focusing investments on international payers and buyback companies would be one way investors might gain exposure to these underperforming markets in a potentially less volatile way. "...over a long investment horizon, buyback portfolios generated positive excess returns over their parent indices in the U.S., Canada, Europe and global markets. All of the buyback portfolios tested generated higher average monthly excess returns over their parent indices in down markets than in up markets, no matter which weighting schemes were employed in the portfolio construction." "The equal weighting method employed in the construction of buyback indices enhances the index performance in terms of win ratios and excess returns in up markets, making the outperformance of buyback indices more balanced in both up and down markets. However, the equal weighting method also boosted the index volatility. In comparison, the market cap weighted buyback indices tended to have lower volatility than their parent indices. The impact of equal weighting is more significant in the large-cap space than in mid- and small-cap spaces." "Style analysis indicates both equally weighted and market cap weighted buyback portfolios are value tilted in the past 14 years that ended March 31, 2014. The overlay of equal weighting may enhance the value tilt and give the portfolios an extra small-cap bias, especially in the large-cap space. Compared with dividend investing, buyback investing strategy has several unique features if both employ an equal weighting method. Buyback portfolios tend to have lower dividend yields and most of their outperformance comes from capital gain instead of dividend income, which is a significant contrast with dividend yield portfolios. In the U.S. and Canada, buyback portfolios have tended to have more balanced win ratios or excess returns in both up and down markets, which could be a good complement to defensive approaches such as dividend and low volatility strategies." Below are excerpted comments from our firm's CEO, Terry Horan, that was sent via email to employees this morning and I want to share it with our readers, many who are clients. 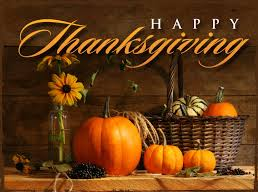 "Best wishes to you and your family for a wonderful Thanksgiving Holiday. Have a great time and enjoy the time together with family and friends..."
"There was a bit of a discussion in the office about the timing of Thanksgiving. Of course, the Pilgrims were the first to celebrate the holiday as a way of giving thanks for surviving their first year in America. They were aided by an Indian tribe who taught them to plant and harvest food. In thanks, the Pilgrims invited their Indian friends to the first Thanksgiving celebration. It lasted three days." "While many states and cities celebrated a Thanksgiving, it did not become an official holiday until Abraham Lincoln declared it so at the height of the Civil War in 1863. He asked the nation to pray for those who lost loved ones in the war. Lincoln decreed that Thanksgiving should be celebrated on the last Thursday of November. However, Franklin Roosevelt moved the holiday to the third Thursday of the month of November in order to spur retail sales during Christmas. This move was met with massive opposition and some derided the day by calling it "Franksgiving." Personally, I think he was the inventor of the first "black Friday." It was changed to the current date two years later and has stayed that way ever since." "The concept of pardoning Turkeys by the President is rather recent. President Obama pardoned Mac and Cheese, two Ohio turkeys, yesterday. The first President to officially pardon turkeys was George H. W. Bush (41). Turkeys had been pardoned by previous Presidents, specifically Kennedy and Reagan, but it was not a regular part of the holiday." "Enjoy the day, give thanks for this very unique American holiday and thank you [to all our clients and friends for allowing us to assist you in meeting your Health, Wealth and Life needs.]" Today's report on jobless claims at 313,000 was higher than the expected level of 292,000. 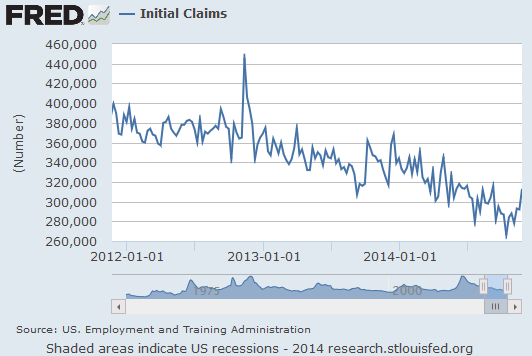 This level of claims was the highest since the week of September 20th when claims were reported at 295,000. This trend in claims would need to reverse going into year end or the higher trend would be an indication of a weakening job market. Further, today's weaker than expected report possibly speaks to broader weakness in the overall economy. Labor market conditions in the U.S. have been far from robust. The potential canary in the coal mine has been the steadily declining participation rate in the U.S. as noted with the blue line in the below graph. A number of economists have attributed the declining participation rate to the increase in retirements of the baby boomers. This conclusion is important for those that believe the decline in the participation rate is baby boomer related, otherwise, the decline would be attributable to an overall weak economy and labor market. Importantly, the baby boomer phenomenon is not isolated to U.S. demographics and was a result of the environment following World War II. 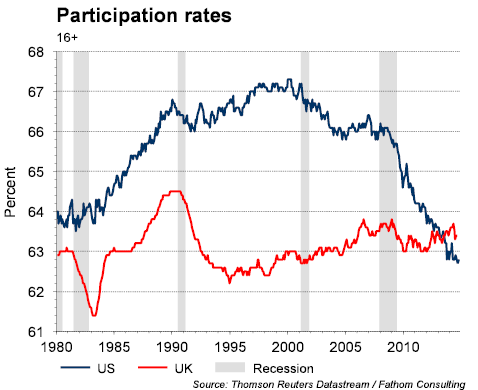 As can be seen in the above chart, the participation rate in the U.K. has not seen the same level of decline as experienced in the U.S. 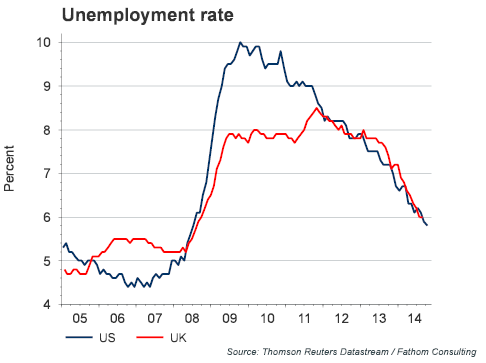 In fact, if one looks at the U.S. headline unemployment rate compared to the U.K.'s in the chart below, both are at nearly the same level. In the U.S. the headline unemployment rate is known as the U-3 rate. The broadest measure is the U-6 which includes discouraged workers, all other marginally attached workers and those workers who are part-time purely for economic reasons. 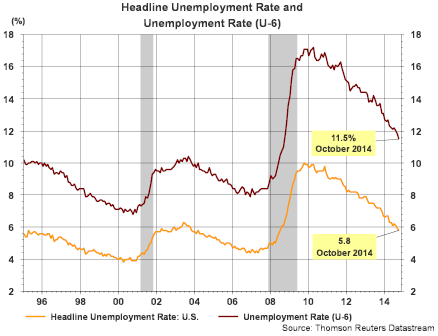 As displayed in the below graph, the U-6 unemployment rate equals 11.5% versus the headline rate of 5.8%. The U-6 unemployment rate remains at a level higher than the 8% reached prior to the last recession. "The recovery is impressively robust. Employment set a new record in the three months to November, reaching 30.1m. The number of Britons in work has risen by fully 280,000 since the summer. Unlike in America, where unemployment is declining in part because discouraged workers are dropping out of the labour force, inactivity is declining in Britain. The share of people in work is within striking distance of an all-time high. Job growth has been strong across private industries; unemployment is falling for all age groups." The Economist magazine article comments on the decline in the U.S. unemployment rate being a result of workers dropping out of the labor force. In conclusion, the health of the U.S. labor market is anything but robust and indicative of a below potential growth in GDP. 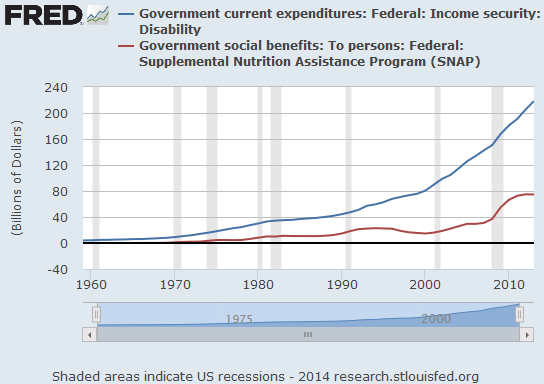 Ancillary support programs, such as food stamps and disability insurance, continue to show increasing and high levels of usage. The decline in the participation rate in the U.S. seems to be more a function of a somewhat weak labor market than an increase in baby boomer retirements. Last week was a mostly positive one for equity markets around the globe. The reason for all the optimism was unleashed on Friday when Mario Draghi indicated he was ready and willing to provide QE in an effort to stimulate growth in the euro zone. And not to be outdone, the People's Bank of China announced a reduction in its one year lending rate. These announcements moved equity prices higher on Friday and resulted in strong weekly gains for equities. For example, on the week, France's CAC Index was up 3.4%, Germany's DAX was up 5.2%, the S&P 500 Index was up 1.2% and the Dow was up 1.0%. The laggard continues to be U.S. small cap (Russel 2000 Index) which was down .1% for the week. "As of the close yesterday, S&P 500 was up 11.1% year-to-date. Should these gains grow or at least remain intact through yea-rend, it would be just the fourth time in 84 years of S&P 500 data in which there have been three or more consecutive years of double-digit gains. In all past occurrences the year after the third year of double-digit gains was also up double-digits for an average gain of 23.1%." This will be a shortened trading week due to the Thanksgiving holiday in the U.S. Important economic reports will be released during the week though. For more insight into the coming week, below is the link to this week's magazine. Investment advisors having discretionary investment authority over $100 million or more in assets are required to report holding detail to the SEC in a 13F filing on exchange listed securities. In the third quarter of this year the filing deadline was November 14, 2014. S&P Capital IQ recently provided a summary of the changes made by ten large hedge funds in their third quarter filing versus the second quarter filing. A report summary can be found at the below link. 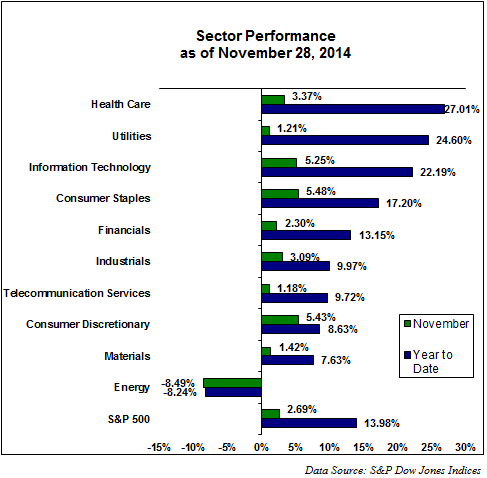 The sector attracting the most buying attention in the third quarter was the energy sector. Information technology saw the most selling activity. 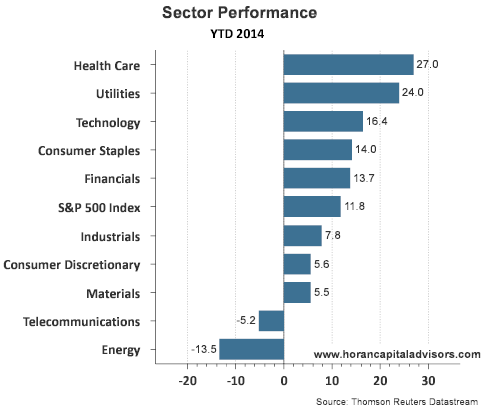 The attention given to the energy sector is not a surprise given the weak performance of the sector this year. 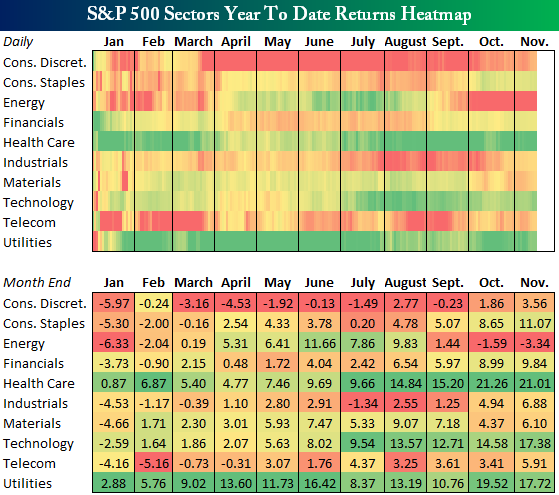 The below chart created by the Bespoke Investment Group displays a heat map of the year to date S&P 500 sector performance over the course of this year. Notably energy is the laggard. Investors should keep in mind that this type of hedge fund information can change significantly during the filing deadline date and quarter end. The pump price of a gallon of gasoline continues to drop in the U.S. This decline in gas prices is believed to result in a pickup in consumer spending since the consumer will be spending less on gasoline. Specifically, the spending increase is expected to flow through to an increase in retail sales. Guggenheim Partners wrote a comment, Falling Gas Prices Fuel Holiday Cheer, that noted an increase in discretionary spending as one's gasoline consumption as a percentage of disposable income declined. The chart below graphically depicts this relationship. On the other hand, as the following chart indicates, if one compares the simple decline in a gallon of gas to retail sales (excluding sales at gasoline stations), declining gas prices do not seem to equate to an increase in retail sales. 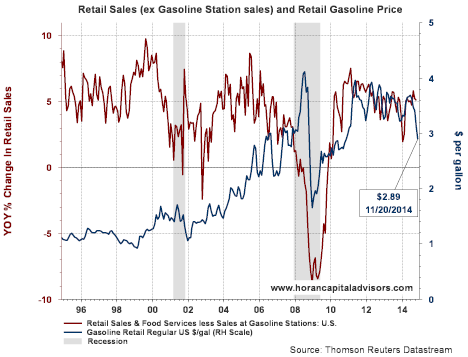 As the below chart shows, it actually appears as gas prices decline retail sales decline as well. So what is the broader implication then? Certainly, a number of factors impact the price of oil and the resultant price of gasoline. A large factor influencing energy prices is of course supply. With the positive supply impact of fracking's success, this pushes gas prices lower. The primary contributor to retail sales growth is an increase in a consumer's disposable income. 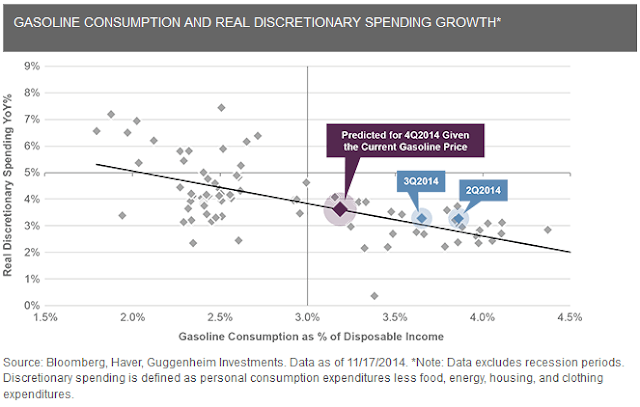 Disposable income certainly increases if consumers are spending less on gasoline. However, in our view, a greater impact on retail sales growth is the overall health of the economy which translates into job growth and wage growth. 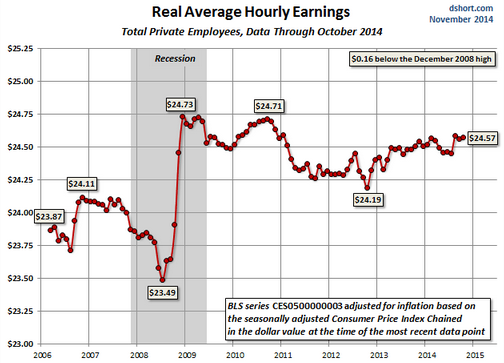 On the wage front, employees have been experiencing real wage growth since the end of 2012 as noted in the below chart created by Doug Short at Advisor Perspectives. In a New York Times article from earlier this year, it was noted that some economists do believe the slowing in wage growth is behind us in this economic recovery. From an employment perspective though, the economy and job market have not recovered at a rate commensurate with prior recoveries. The below chart looks at the trend in the unemployment rate and currently the rate equals 5.8%. 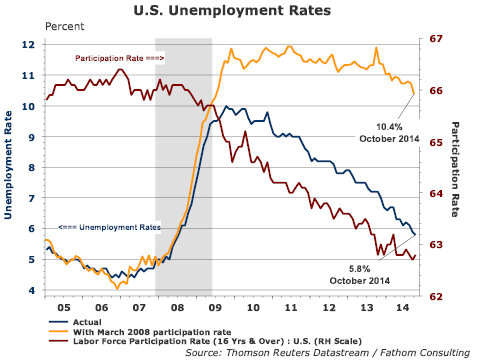 However, the yellow line in the below chart displays the unemployment rate using the participation rate in March 2008. Using the 2008 participation rate results in an unemployment rate that turns out to equal a much higher 10.4%. There is debate about the cause of the declining participation rate. Some believe it is due to baby boomer retirements while others believe it is the result of individuals dropping out of the labor force. Bill McBride at Calculated Risk does a nice job providing analysis around the participation rate. 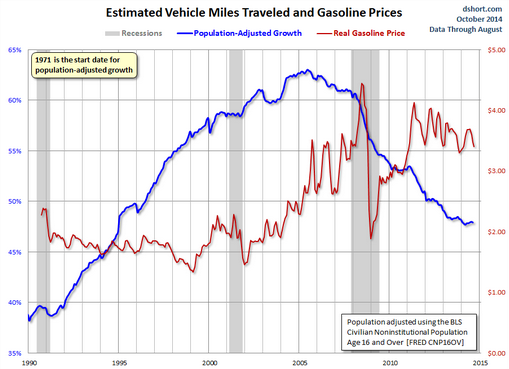 Lastly, given the decline in gasoline prices, one might expect individuals to travel more in a strengthening economy. Again, Doug Short has assembled a lot of good information on vehicle miles driven and one particular chart below shows a steady decline in miles driven. "As is readily apparent, the correlation is fairly weak over the entire timeframe. And, despite the volatility in gasoline prices since the onset of the Great Recession, the correlation since December 2007 has been even weaker. There are profound behavioral issues apart from gasoline prices that are influencing miles traveled. These would include the demographics of an aging population in which older people drive less, continuing high unemployment, the ever-growing ability to work remote in the era of the Internet and the use of ever-growing communication technologies as a partial substitute for face-to-face interaction." In conclusion, a decline in gasoline prices alone will not simply result in higher retail sales. Of primary importance is a strong economy where GDP growth is in the 4-5% range; thus, creating an environment where job and wage growth are strong. We believe the current economic environment is one where growth remains below the economy's full potential and results in under employment. The impact on the retail sector is one where investors will need to be selective. A rising economic tide currently being experienced is not likely to result in across the board strength in retailers. Recent earnings reports do reflect this situation, with some retailers exceeding expectations and others falling short of expectations. As an example, last week, Urban Outfitters (URBN) fell over 6.5% after missing earnings before recovering at week's end. Gap (GPS) exceeded 3Q estimates but was cautious on Q4 guidance. The stock fell over 4%. I could list a number of other retail reports, but suffice it to say, lower gasoline prices are not benefiting all retailers. In fact, a move higher in pump prices might be more of a sign of a stronger economy and have a greater positive influence on retail sales. Updated (11/22, 3:14pm): Thomson Reuter's AlphaNow site provides a summary of Q3 retail reports in an article titled, Q3 Retail Same Store Sales Report: 50% Beat Estimates, 47% Fall Short. Disclosure: No position in GPS or URBN. Today China announced a rate cut, the first in two years, and Mario Draghi announced the ECB would expand its stimulus program if inflation did not return to the ECB's target level. These two announcements have resulted in global equity markets spiking higher. The two actions are likely to result in further strength in the US Dollar. With this in mind, investors should remain cognizant of market performance when the dollar strengthens. 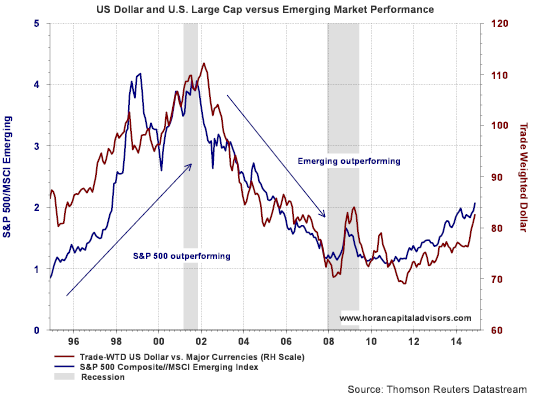 As the below chart shows, emerging markets historically underperform the S&P 500 Index in a period of Dollar strength. "The Dow just made another all-time record high. 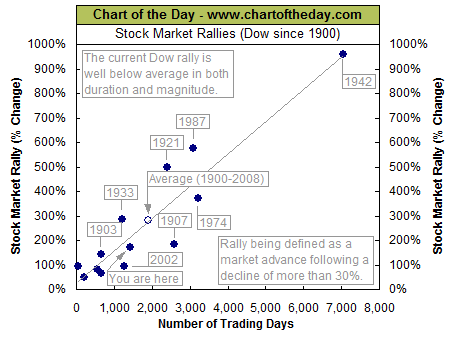 To provide some further perspective to the current Dow rally, all major market rallies of the last 114 years are plotted on today's chart. Each dot represents a major stock market rally as measured by the Dow with the majority of rallies referred to by a label which states the year in which the rally began. 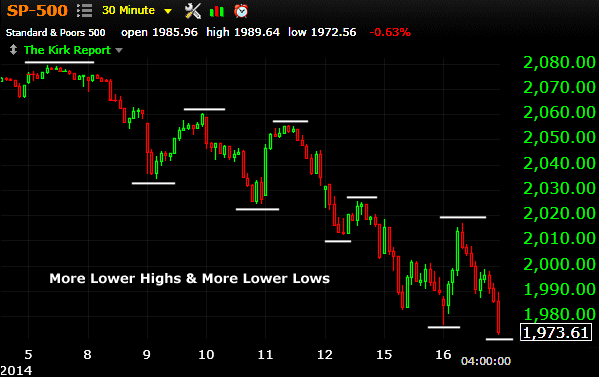 For today's chart, a rally is being defined as an advance that follows a 30% decline (i.e. a major bear market). As today's chart illustrates, the Dow has begun a major rally 13 times over the past 114 years which equates to an average of one rally every 8.8 years. It is also interesting to note that the duration and magnitude of each rally correlated fairly well with the linear regression line (gray upward sloping line). As it stands right now, the current Dow rally that began in March 2009 (blue dot labeled you are here) would be classified as well below average in both duration and magnitude." Looking at the chart on its own would suggest this rally could have more room to run to the upside. 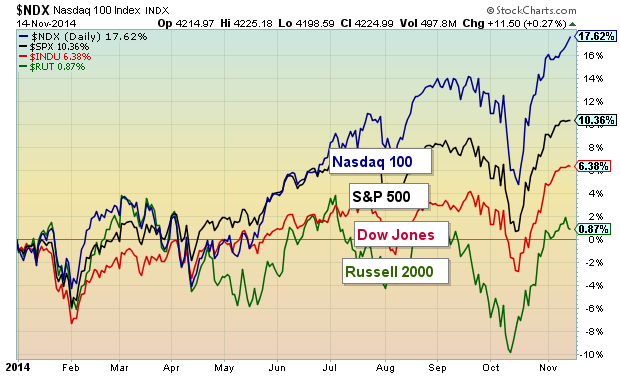 Over the weekend Andrew Nyquist published an article on See It Market's website titled, Is The Nasdaq 100 Overheating? The article noted the sharp advance of the Nasdaq 100 Index in 2014 versus other U.S. focused indices as noted in the below chart from the article. The strong index performance can be partly attributed to the strength in Apple's stock as it comprises nearly 15% of the Nasdaq 100 Index. Market commentary over the past week seems to be centered on the extended nature of the U.S. equity market and the possibility of an imminent correction. As we have noted, along with many others, the sentiment indicators seem decidedly bullish and they tend to be contrarian signals. 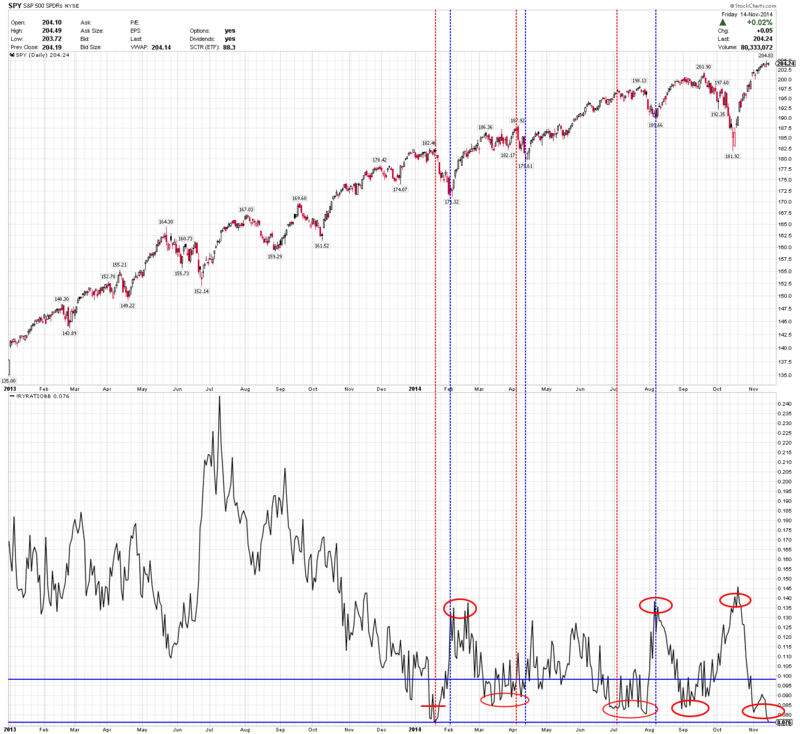 Last week we noted the bullishness in the AAII individual investor sentiment survey while others have noted the extreme low in the Rydex Bear/Bull Ratio. As the first chart above notes, equity market strength has been centered in the larger cap U.S. markets (Nasdaq 100, S&P 500 Index and the Dow Jones Industrial Average) Markets that are not hitting new highs on a seemingly daily basis are those outside the U.S. 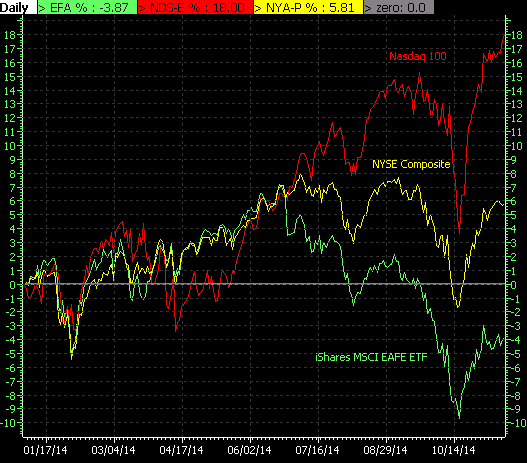 The below chart shows the lagging MSCI EAFE Index and the lagging NYSE Composite. I include the NYSE Composite for two reasons. 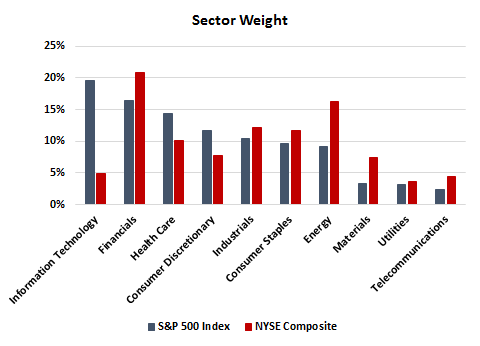 the technology weight in the index totals 4.9% versus 19.6% for the S&P 500 Index. At HORAN we still maintain a positive view on U.S. equity markets. However, the lagging nature of markets outside the U.S. and lower valuations are presenting investors with potential investment opportunities if they believe the U.S. market is extended. If an investor desires to maintain exposure in the U.S., there are sectors that have lagged the broader market as well, for example, energy and materials, just to name a couple. It is difficult to time the market, but foreign oportunities are beginnig to look interesting if one's time horizon is three to five years out. Some of the article links in the Week Ahead Magazine below look at potential contrarian investment opportunities. One factor evident this earnings season is the stronger US Dollar is likely having a negative impact on companies more exposed to global business. Certainly, the economic slowdown in Europe is having an impact as well; however, the recent strength in the US Dollar has been a headwind for multinational companies as well. 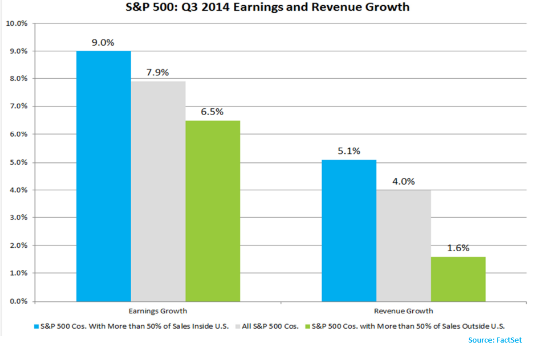 Factset recently summarized company revenue and earnings growth for S&P 500 companies that have reported third quarter earnings. As the below chart shows, companies with more than 50% of their business generated outside the U.S. have reported a lower revenue and earnings growth rate. Earlier this week S&P Dow Jones Indices, along with MSCI, announced real estate investment trusts (REITs) will be separated into their own sector under the Global Industry Classification Standard (GICS®). The current REITs contained within the S&P 500 Index are noted in the below spreadsheet. "Real Estate, previously part of the GICS financial sector, will be the 11th sector while the financials will now be limited to financial services such as banking, insurance or exchanges. This is the first time since GICS was launched in 1999 that a new sector is being added." The changes to the indices are anticipated to be implemented after the market close on August 31, 2016; however, final details will be announced by March 13, 2015. Individual Investors Becoming Too Bullish? Yesterday the American Association of Individual Investors released their weekly sentiment survey. As the below chart clearly indicates, individual investors have certainly become more bullish. Some highlights from this week's survey report. 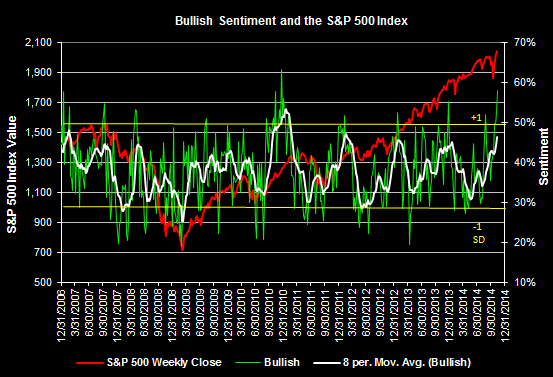 Bullish sentiment of 57.91% is a high for this year. The bull/bear spread of 38.6% is at a high for the year and above the average plus one standard deviation totaling 26.8%. Since mid October when the bullish sentiment fell to 35.42%, the S&P 500 Index is up over 9%. As noted in prior sentiment posts, these type of behavioral indicators are most predictive at their extremes. Given the decline in silver prices, it is not surprising we are beginning to field questions from investors about the potential opportunity in silver and commodities in general. 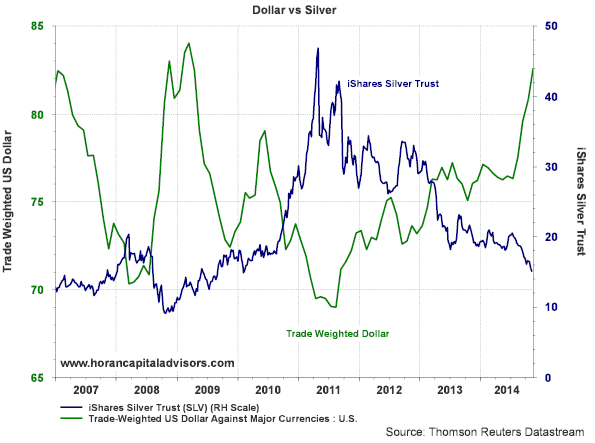 One of the easiest ways investors are able to invest in silver is via the exchange traded fund, iShares Silver Trust (SLV). 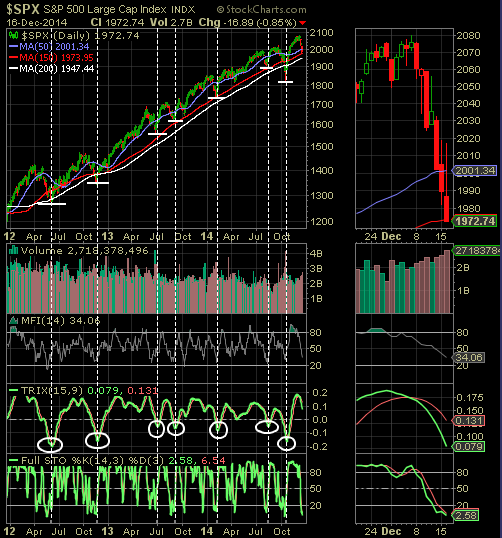 As the below chart shows, this index has been on a fairly steady decline since peaking in early 2011. As timing would have it, today's Wall Street Journal contains an article on small investors loading up on silver, Small Investors See Silver Lining. The WSJ article contains commentary from some strategists who believe the silver ETF could fall to $8 before finding support. Investors should keep in mind silver traded below $5 in early 2003. 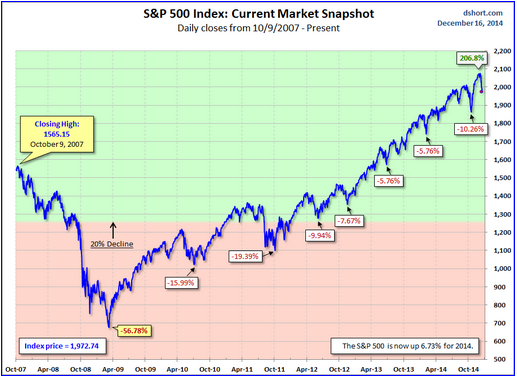 Lastly, the below chart looks at a weekly time frame going back to early 2011. The red dotted line shows the ETF continues to trade under long term resistance. 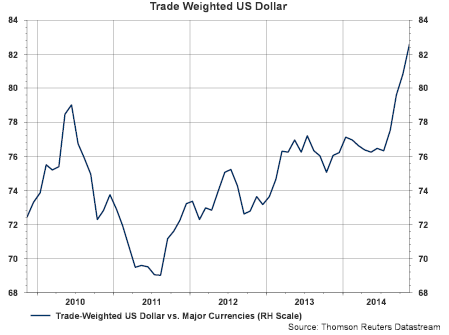 Many forecaster believe the US Dollar could trade with parity to the Euro before we see an end to US Dollar strength. 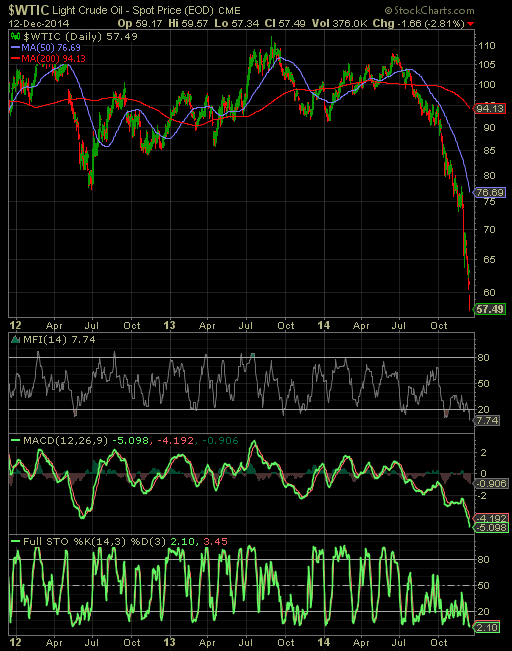 If this were to occur, commodity related investments would continue to face downward price pressures. We commented on the relationship to dollar strength and commodity prices in an article last year, Interest Rate Policy To Impact The Dollar And Commodity Related Industries.